Listen offers many solutions for applications that require audio, but where running cables may not be an option. Some of these applications typically include assistive listening or language interpretation. But, because of its versatility, Digital Infrared can be used for so much more. This blog will focus on the use of this technology in unique, out of the box projects. Before I share these interesting applications I just want to give a little education on the technology of Digital Infrared. I think this will help open your mind to the capabilities of Digital Infrared. Okay, it’s time to think outside the box. Here are a couple of applications that are not a typical way of using Digital Infrared but that are providing a great solution for distributing audio. 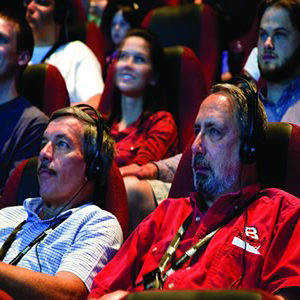 The Belk High Octane Theater at the NASCAR is used for watching races on the giant panoramic screen. Here fans of the sport can purchase a ticket to the museum to watch the race, and tune into their favorite driver and listen to the radio transmissions with his/her team. The system can have up to 32 different drivers and team participate in the broadcast. The system a can appease the ADA regulations of assistance for those in need. For many fans, this is a dream come true to be part of the action. A lot goes on in the course of the race, and now you are in the pit crew with the team. The Riverside Community College (RCC) Early Childhood Education Program provides an educational and practical foundation for students interested in working with children from infancy through third grade. In addition to theoretical principles, the curriculum offers practical skills and on-site training that will prepare students for employment in the field of Early Childhood Education. The center has two large rooms where the children can interact, play, and learn. Each of the two rooms has a glass wall between them forming two smaller rooms for a total of four rooms. The glass walls allow for observation by teachers, parents, students and doctors. There are two alcoves that allow a view of two rooms. The Digital IR Radiator is placed in the alcove. Four microphones have been placed in each room to provide audio to the observers. The microphones are hanging shotgun style microphones and each microphone has a dedicated channel on the Digital Infrared system. It’s designed so that students, faculty, and parents can observe children without the kids knowing they are being monitored. Observers are using Listen/DIS DR 6032 Digital IR 32-Channel Receivers to scroll thru and pick up the audio from each microphone. Observers check out pack and headphone then follow instructions on the wall. This solution allows observers to easily monitor each child in different developmental stages. Listen products are giving these students and professionals the ability to assist and guide children as they grow. There are so many others applications. So, start thinking outside the box. Digital IR can provide up to 32 channels of crystal clear wireless audio anywhere you may need.